CANINE COLLARS guarantees our products against any flaws in materials or workmanship. We can not accept returns for "print is too large". Recomendations are posted on every collar page. If it appears to be a larger print and doesn't have a * next to it, then it is a larger print. We try our best to center a print on as little as 1/2" area and even 1" is not a lot of space. Also, print fabric repeats can greatly vary. If this is a concern, please order collar fabrics with an * or solid colors. If you are not satisfied, please contact us immediately. Collars and leashes are CUSTOM MADE so a loss is incurred once they have been rerturned. SPECIAL ORDERS and SPECIAL REQUESTS (different sizing, Martingale, buckle, hardware requests) are NOT REFUNDABLE. Please double check to make sure the size is right.CLEARANCE ITEMS are NOT REFUNDABLE. Please don't return merchandise without notifying us first. We will email you return instructions. It is recommended to insure returned merchandise. You may return your items within 15 days, unused. CANINE COLLARS will issue replacement or shop credit for returns. There will be a $10.00 exchange/return restocking fee per collar and a $15.00 fee per leash if return is not due to CANINE COLLARS error. You will be required to pay the shipping charges for any exchange. This policy will also apply for wrong size orders so please review size charts and measure your pets neck carefully, adding an inch or two for comfort. It is better to go up a size than to order too small. 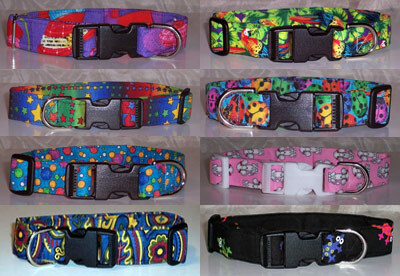 Please consider ordering one collar if this is your first order and unsure if your pet would like these collars. It's much better than placing a large order and not being able to return them. Again, these are handcrafted custom made to order collars. Returned collars are donated to shelters, they are not resold.